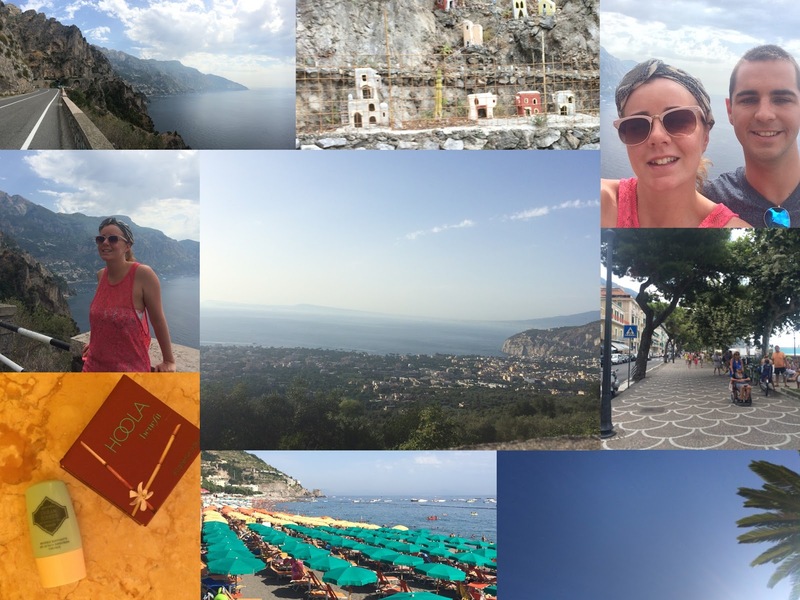 After grabbing our beach towels and SPF, we jumped in our fabulous little Fiat 500 and head away from Sorrento, over to the opposite side of the peninsula and take in some of the picturesque sights that the Amalfi coastline had to offer. Now the roads in and around Sorrento and the Amalfi Coast are quite narrow in places, they’re quite windy and on this day in particular, quite busy! In addition to the roads being as they are the locals are either brave or mad or a combination of the two, especially when in charge of a scooter so if you hire a car keep an eye out for them! I don’t know if it is traditional for the locals to all head to the beach on a Sunday lunch time but on this day they certainly appeared to have and so after going through several towns where parking was full we were about to call it a day and turn around when we stumbled into Maiori. Parking was €20 for 6 hours in an underground car park on the beach front and after a short walk down the promenade we found Eldorado Restaurant and decided to grab ourselves a table for lunch. After travelling around 1500 miles and waking to clear blue skies we were a little surprised by the, albeit short, shower that arrived at the restaurant at the same moment we did! However, we grabbed a table overlooking the beach, under an umbrella and ordered some drinks to start with. I am a massive fan of Italian food (intolerances were ignored on this trip I must admit) and opted for Gnocchi Sorrentine whilst Paul ordered the most amazing Lemon Ricotta Ravioli. After eating we made the short walk to the free area of the beach and whiled away the afternoon there hiring a couple of deck chairs for €6 and enjoying the sun, the hustle and bustle of Italian life going on around us and of course a couple of Cornettos! Before heading away from Maiori and back towards Sorrento, we had a quick drink at one of the beach bars dotted on the shoreline before collecting the car and enjoying the quieter roads on our way back to the hotel. After being out all day, it seemed like the perfect opportunity to try out the hotel’s restaurant for dinner. On and evening the poolside snack bar is transformed into a wonderful, 5* restaurant; you are greeted at your candle-lit table with a glass of Prosecco and encouraged to embrace the Italian dining experience with complimentary bread and entrees delivered to your table. Still feeling rather full from lunch we decided to skip starters and jump straight into the mains, Paul again opting for a Fillet and myself for a Porcini Mushroom Risotto with truffle oil. The risotto was by far the best I have ever had, full of flavour and the perfect portion size. Although by this stage we were pretty full, we made room for dessert and ordered a Tiramisu style dessert and a White and Milk Chocolate Mousse. Both were fantastic, with the mousse melting in your mouth despite being super thick and luscious, accompanied by a chocolate cup filled with Baileys on the side and the Tiramisu was served in a dark chocolate bauble on a biscotti base and drenched in fresh espresso. We were able to stay at our table after the meal and sat chatting, putting the world to rights and taking in some of the live music that was on offer. It was such a wonderful setting, dining under the stars and I probably felt more relaxed on this night than any other and after a while we headed to bed feeling very satisfied indeed!